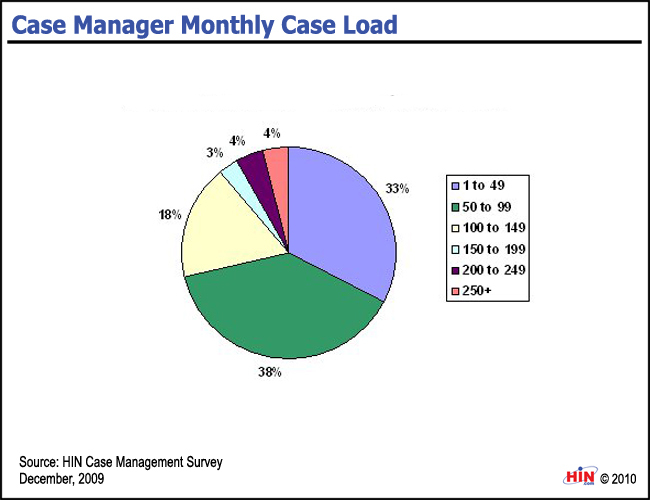 As shown in the following graphic recently published by the Healthcare Intelligence Network, it has become common practice to use “case load” as a metric for the productivity of nurses in case management programs or as a measure of the intensity of a case management intervention. 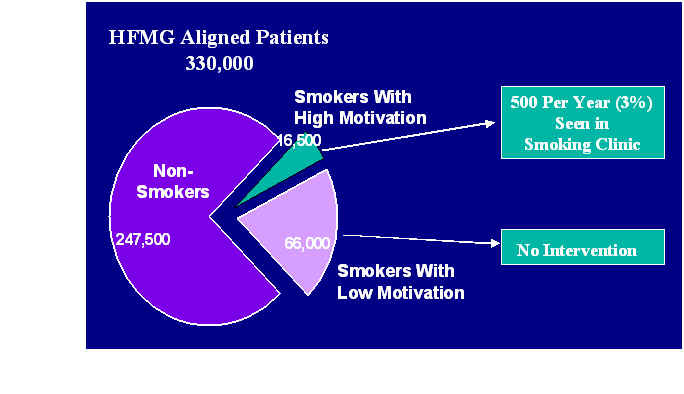 More broadly, case load has been used for these purposes across many wellness and care management interventions, including chronic disease management, high risk care coordination, wellness coaching, care transition coordination, and other types of programs involving nurses, physician assistants, nutritionists, social workers, and physicians. If everyone is doing it, it must be right. Right? In my opinion, case load is almost always the wrong measure to use to assess productivity or intervention intensity. 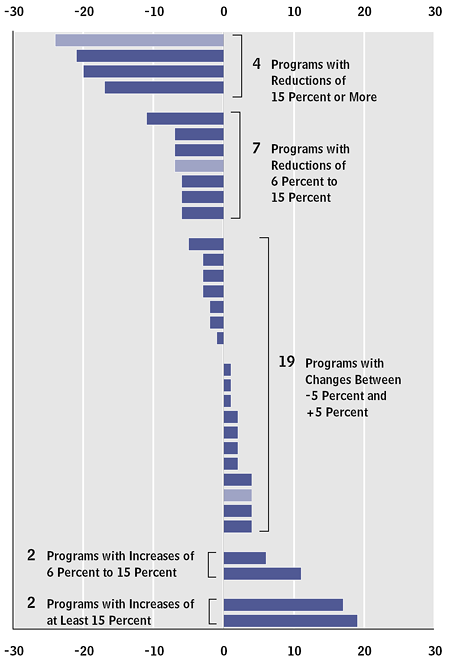 The graphic above indicates that 38% of case management programs have a case load between 50 and 99. Let’s say that one of those case management programs told you that they had a case load of 52. That literally means that the average nurse in that case management program has a list of 52 patients (on average) that are somewhere between their enrollment date and their discharge date for a the program. That could mean 52 new patients every day for an intervention consisting of a single 5 minute telephone call. Or, it could mean 1 new patient each week for a year-long intervention involving an extensive up-front assessment and twice-monthly hour-long coaching calls. Or, it could mean 1 new patient each week for a year-long intervention consisting of a 20 minute enrollment call and a 20 minute check-up call one year later. In that context, if I tell you that my case management program has an average case load of 52, how much do you really know? Some case management programs try to fix this problem by creating an “acuity-adjusted” or “case-mix-adjusted” measure of case load. In such a scheme, easier cases are counted as a fraction of a case, and more demanding cases are counted as more than one case. Such an approach requires some type of a point system to rate the difficulty of the case. Some case management vendors charge a fee for each “case day,” with higher fees associated with “complex” cases, and lower fees for “non-complex” cases. 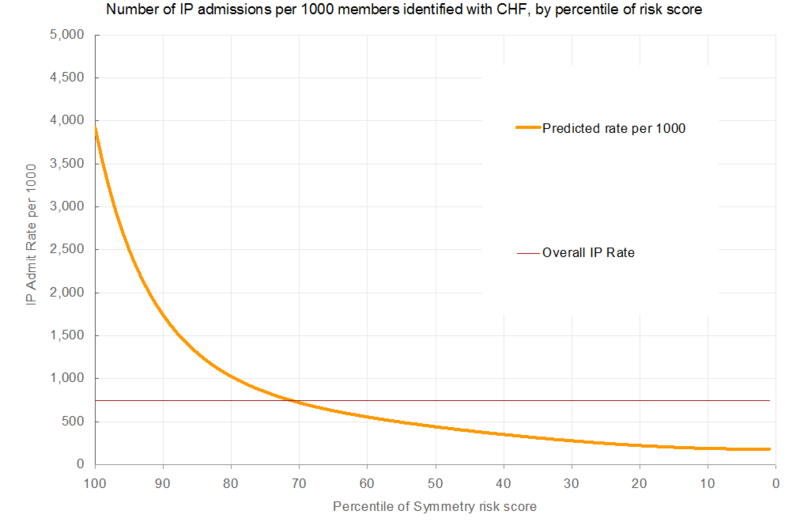 You can imagine how the financial incentives associated with the case definition can affect the assessment, and how reluctant the case management vendor would be to discharge cases, cutting off the most profitable days in the tail-end of a case when the work is light. But these “adjustments” are missing the fundamental point that case load is a “stock” measure, while the thing you are trying to measure is really a “flow.” A stock is something that you count at a point in time, like the balance of your checking account or the number of gallons of gas left in your tank. A flow is something that you count over a period of time, like your monthly expenses or the number of gallons per hour flowing through a hose to fill up your swimming pool. The work output delivered by a case management nurse is something that can only be understood over a period of time. 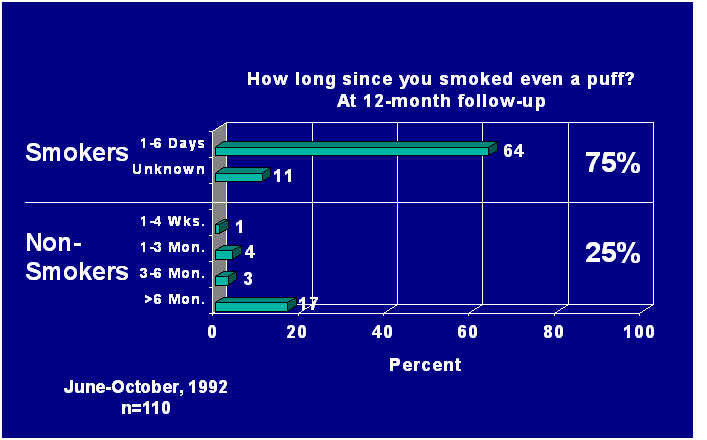 In my experience, the best approach to measuring case management productivity and intensity is to follow “cohorts” of patients who became engaged in the intervention during a particular period of time to track how many minutes of work are done for each period of time relative to the engagement month, as shown below. This graph shows that, during the calendar month in which a patient became engaged, an average of 50 minutes of nursing effort was required. For individual patients, the nursing effort could, of course, be higher or lower. Some patients require more time to assess. Some patients may have become engaged at the end of the calendar month. Some patient may drop out of the program after the first encounter. 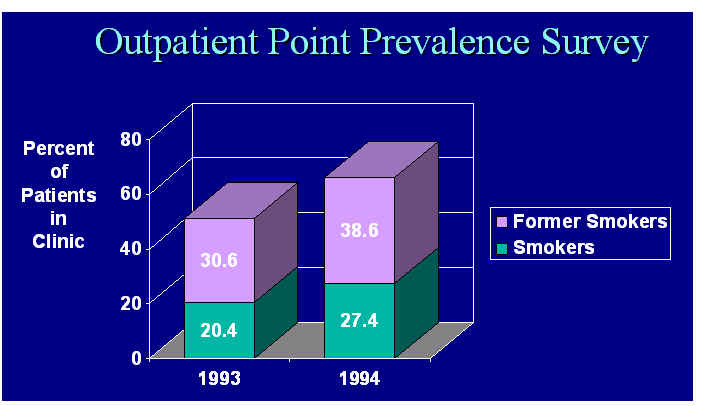 But, on the basis of a cohort of engaged patients, the average was 50 minutes. In subsequent months, the average minutes of nursing effort typically decreases, after initial enrollment, assessment and care planning effort dies down. 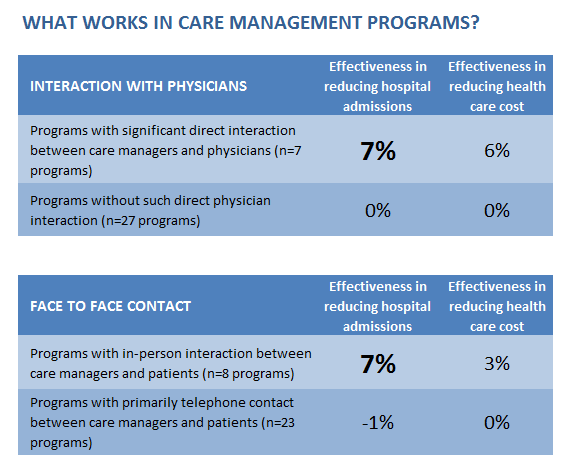 Over time, depending on the intended design of the intervention, the effort falls off as most patients have either been discharged by the nurse, have chosen to drop out, or have been lost to follow up. 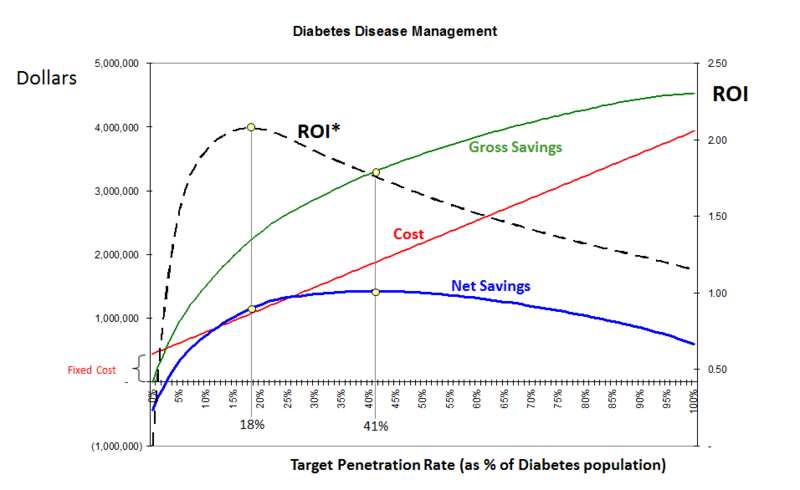 This graph is a description of the intensity of the case management intervention. 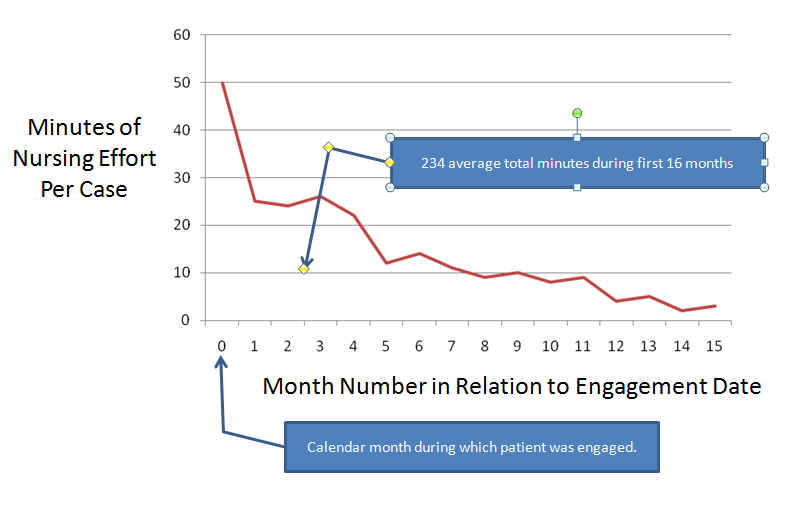 In this example graph, the cumulative nursing time over the first 16 months relative to the month of engagement is 234 minutes, which could serve as a summary measure of intervention intensity. If nursing minutes data are not available, some “work-driver” statistics could be substituted, such as the number of face-to-face or telephonic encounters of various types. These could be converted to minutes based on measured or estimated average minutes of effort for each of the statistical units. 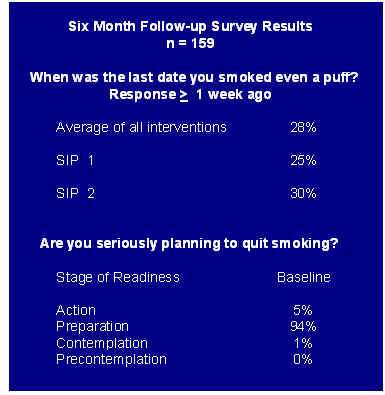 This type of graph can be created for different engagement months and compared over time to determine if the intervention intensity is changing over time. It can be created for one nurse and compared to all other nurses to determine if the intervention process delivered by that nurse appears to be similar or different than other nurses. Then, to assess productivity, the total number of nursing minutes can be measured, and compared to the expected number of minutes for cases of the same type and the same mix of “month numbers” in the case intensity timeline. The implications of this for Accountable Care Organizations is that information systems to support wellness and care management should be designed to explicitly capture the engagement date and the intended type of wellness or care management intervention in which the patient is becoming engaged. Such systems should also capture the discharge dates, statistics about the quantity and types of wellness or care management services delivered to engaged patients, and preferably the number of minutes of effort required for each of those services. Some people may object to this approach because it implies that the patient is being subjected to a “cook-book” intervention that fails to take into account the uniqueness of each patient. And, they argue that they cannot specify up front the type of wellness or care management program in which the patient is becoming engaged, because they have not yet completed an assessment. But, I would argue that nothing in this approach assumes that each patient is treated the same. 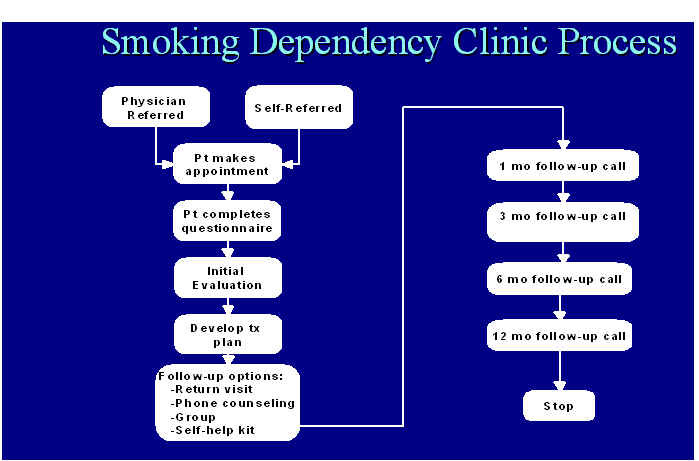 This approach merely looks at a population of patients receiving a particular intended type of intervention program. Although each patient may follow a different path and receive a different mix and quantity of case management services, the overall mix and timing of services for a population of patients can be assessed. If this mix and timing is not generally constant over time, then you are dealing with a process that is not in control, a problem that must be solved before meaningful program evaluation of any type can be done. The implementation of best practices to improve the quality and efficiency of health care involves making changes to both decision-making and care-delivery processes. The care management methods for improving these processes are largely borrowed from the work of Deming, Crosby, Juran, Ishikawa, and other practitioners of industrial process improvement. These methods are alternatively described as Continuous Process Improvement (CQI) and Total Quality Management (TQM). Berwick, James, and others described the adaptation of these methods for health care. On a practical level, clinicians apply these methods by working with other members of their clinical team to make local improvements, or, in larger health care organizations, by participating in multi-disciplinary teams organized at an organizational level. These teams often require expert consultation in analytical and statistical methods. Statistical process control involves the application of quality engineering concepts to administrative, support and care delivery processes in order to (1) detect changes in process performance over time, (2) identify assignable causes of variation, and (3) adjust relevant process input variables so as to maintain a process performance criterion within a desirable range. Another implementation approach is staff training or continuing medical education. This involves the development and delivery of classes and organized curricula, with the objective to improve knowledge and skills to increase the effectiveness of clinicians, administrative staff, and support staff. Some training is intended to increase knowledge and skills in process improvement methods, to improve the effectiveness of CQI or TQM teams. Other training is intended to have a more direct effect to improve decision-making and care delivery processes by teaching clinicians about specific diagnosis and treatment strategies. Traditionally, this latter approach has been accomplished through grand rounds and seminars. Another approach, based on methods developed for the marketing of pharmaceuticals and devices, is academic detailing. Academic detailing is a form of educational outreach involving the the personal delivery to clinicians of brief educational messages designed to change clinical practice behaviors. 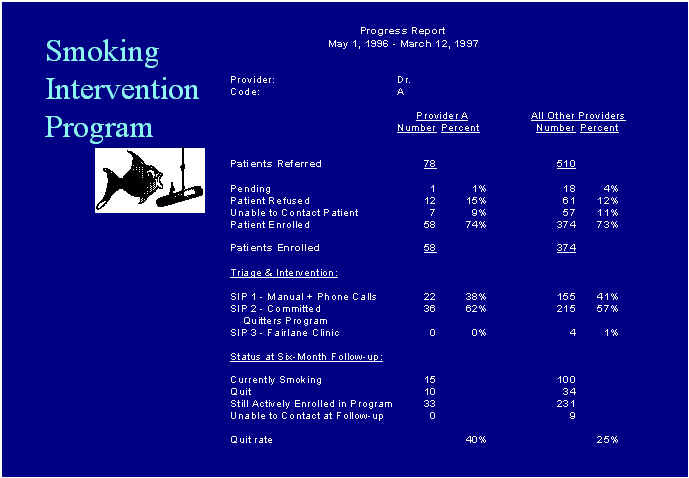 Another approach to implementation involves patient education. Therefore, the methods of patient education materials development represent an important domain of care management. These methods involve the development and pilot testing of brochures, pamphlets, audio and video tapes, class materials, web-based materials, and other products designed to provide useful and timely information to patients regarding their health. An understanding and appreciation of the principles of adult learning are essential to this process. Finally, clinical policy implementation requires the effective application of information technology. Medical informatics is the term used to describe the broader field of information technology applications to health and medical care. Managing intranet resources is an emerging methodological domain of care management, involving the development of internal web-based materials, such as a best practices library or a care management support system. Another important medical informatics method involves the development of computer-based decision aids such as reminders, alerts, and prompts. These are incorporated into the electronic health record as well as associated structured data capture into the clinician workstation and other information systems used by care providers as part of routine practice. A review of rigorous evaluations of clinical policy implementation methods conducted by Grimshaw, et al. 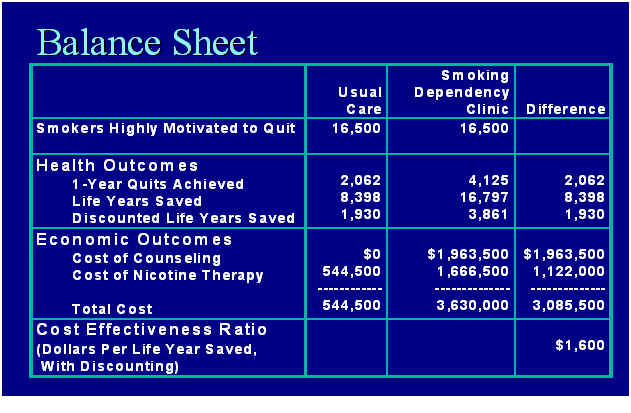 revealed the importance of the methods of guideline development, dissemination, and implementation in predicting clinician behavior change (see table below). In general, multi-faceted implementation approaches have been found to be most effective for improvement processes that involve physician behavior change. Call centers, which receive customer calls and either provides customer service or directs the customer to appropriate staff or resources. Such services may include on-call nurse advice, appointment scheduling, lab result reporting, directions to facilities, billing inquiries, etc. Telephone survey and counseling staff make outgoing calls to patients for the purpose of acquiring information from the patient, such as for a health risk appraisal, survey or follow-up call. They also offer information or services to the patient, such as counseling, needs assessment, and patient education. Distribution of care management materials, including the management of a mail room and stock room to efficiently route care management materials to patients, including patient educational materials and self care supplies. Case managers, typically nurses or other allied health professionals, are required to track patients with defined conditions, assess patient needs, solve problems and deliver other patient services such as counseling, patient education, and social services. In large health care organizations and health plans, these resources may be developed internally. In small and medium size organizations, these services can be outsourced to a growing number of external service suppliers.